Christianity is the predominant religion in Moldova. Nearly half of the population belongs to the Eastern Orthodox Church, and there is also a small Roman Catholic community. Unlike most other Turkic peoples, who are traditionally Muslim, the Gagauz are adherents of Orthodox Christianity. The Communist regime of the Soviet period was officially atheistic and hostile toward religion. Moldova began to experience an upsurge in religious practice in the late 1980s, when the regime relaxed restrictions. This increased after independence, when all restrictions on religious expression were lifted. The cultural development of Moldova was tied historically to that of Romania, reflecting the Romanian origin of Moldova’s majority population. The first Moldovan books were religious texts that appeared in the mid-17th century. Prominent figures in Moldova’s cultural development include the author Ion Creanga and the poet Mihai Eminescu, both of whom wrote during the 19th century. Moldova country lying in the northeastern corner of the Balkan region of Europe. Chişinău, the capital, is located on the Byk River in the central part of the country. Other important cities include Tiraspol and Tighina (also called Bender), both located on the Dniester River in eastern Moldova, and Bălţi, in north central Moldova. The rural population is clustered in large villages. For most of its history, the majority of the territory that constitutes present-day Moldova was the region of Bessarabia, the eastern half of the historic principality of Moldavia. 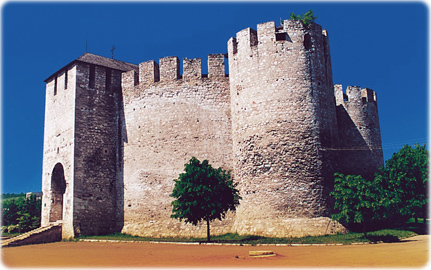 The ancient fortress of Soroca in Moldova. The name Bessarabia derives from a medieval prince, Basarab I, who at one time ruled the southern part of the region. The principality of Moldavia encompassed Bessarabia but extended west to the Siret River near the Carpathian Mountains. From north to south it stretched from the region of Bukovina to the Black Sea. During the Soviet period, Moldova had the highest population density of any Soviet republic, although it was one of the least urbanized. Moldova ratified a new constitution in 1994 to replace the one of the Soviet period. The constitution confirmed Moldova’s status as an independent and democratic republic.